Filologoentzako oharra, Brexit hitza dela eta3. Nazioarteko mailan, ekonomiak gaizki funtzionatzearen errua Brexit-i leporatu nahi izan diote hainbat lanetan. Ikusia daukagu: Hazkunde ekonomikoa txartuz doa, Brexit-en aldeko botoak ez dauka zerikusirik horrekin. Orain gauza bertsua gertatzen ari da Britainia Handian bertan, azti eta zoritxar-igarle guztiak batu dira atsekabezko deialdiak plazaratzeko eta larrialdizko oihuak egiteko, zerua eroriko delakoan… Alta, zerua ez da erori, ezta eroriko ere. 1 Mayday: an international radiotelephone distress call: atsekabe deialdia. 3 Brexit izen ‘propioa’ da, ez arrunta. Beraz, Brexit idatzi behar da eta ez Brexit-a. Ekonomian, gainera, aparteko garrantzia historikoa dauka gertaera horrek. Beraz, idatz dezagun bera letra larriz eta ez letra xeheaz. Argi? 8 Ingelesez: “In the weeks after the Brexit vote, the sore losers were in abundance – predicting the worst and even worse, accusing those who voted the sensible way (to exit) of being dumb, racist, or regretful, or all three things. 9 Ingelesez: “Remember back in mid-June, when the then (failed) Chancellor warned British citizens that if they voted to leave the European Union on June 23 it would be disastrous for the government finances. The BBC report (June 15, 2016) – EU referendum: Osborne warns of Brexit budget cuts – documented the bullyboy tactics that Osborne employed to try to distort voter choice. … have to slash public spending and increase taxes in an emergency Budget to tackle a £30bn “black hole” if the UK votes to leave the European Union. 10 Ingelesez: “In fact, the British ONS released data showing that the UK government actually was in surplus in July 2016. Even with the evidence emerging to the contrary, they are still at it. William Keegan’s article in the UK Guardian (August 21, 2016) – Leavers should be ashamed of the harm yet to come from Brexit – is an example. Keegan is playing it safe. He talks up things which are impossible to verify – among them being his claim that there is now ” an outbreak of buyer’s remorse”. He defers any of his doom predictions to a period in the future where causality will be unclear. So the next recession, whenever it will come, will be Brexit-induced – irrespective of what the policy of the government of the day is at that time. The likes of Keegan will wax on about having told his fellow citizens what venal dopes they were for “the chaos they have helped to create, not least for their grandchildren” by voting to exit the dysfunctional European Union. Structural damage doesn’t emerge the day after a vote is taken – one way or another. If the British economy is “suffering severe structural damage” then it has nothing to do with the Brexit vote outcome. 13 Ingelesez: “It started with the surrender by the Callagan Labour government to the Monetarist madness in the mid-1970s. The trend was accelerated under Thatcher (who wrecked manufacturing and promoted the banksters) and entrenched by Tony Blair and Gordon Brown’s ‘light touch’ financial market regulation – which basically saw all the unproductive, incompetents run riot. It is obvious that the British economy has relied too much on household debt and on housing markets to drive growth. 14 Ingelesez: “The upcoming fiscal statement might have to address some cyclical issues arising from the referendum vote given the amount of doom that was predicted – which may have affected the confidence of households and firms. But we should reject notion that the Brexit vote has suddenly exposed the structural vulnerabilities of the British economy. They have been there for all to see if one could get free of the denial that accompanies the neo-liberal narrative. 15 Ingelesez: “Of course, time will tell whether being out of Europe is going to be the millstone that the doomsayers predicted. I think not. And time is already ticking and the first data is starting to come in – it doesn’t look good for those who are demanding another vote. 16 Ingelesez: “The retail sales data released last week by the ONS covered the period from July 3 to July 30, 2016 – so well after the Brexit vote had concluded and after the doomsayer economists used the week following the vote to predict all manner of crisis and mayhem. The retail sales data measures first-hand how strong consumer spending is – it is immediate and doesn’t lie. The result for July 2016 didn’t produce the strongest monthly growth rate since the GFC but the result was not far off it. 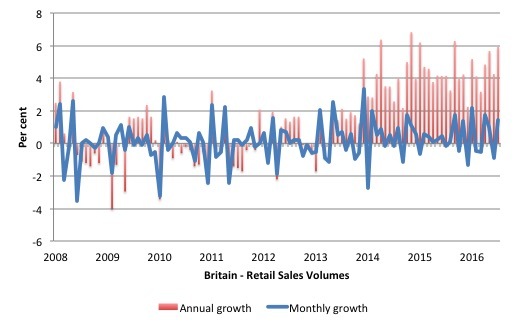 In July 2016, the quantity bought (volume) of retail sales is estimated to have increased by 5.9% compared with July 2015; all sectors showed growth with the main contribution coming from non-food stores. 17 Ingelesez: “So what have we got here? Those stupid Brits spending up big with their last pounds because they are worried the shops are all going to close and the government is going to run out of money as a result of the Brexit vote? Or some genuine confidence, aided by good seasonal conditions, a national team going gangbusters at the Rio Olympics (on raw medal tally that is), and a rejection of the nonsense my profession tried to foist onto them leading up to the Brexit vote. 18 Ingelesez: “Remember this headline from July 14, 2016 – CREDIT SUISSE: ‘Mayday! Mayday!’ — Britain’s impending recession will kill nearly 500,000 jobs. The Jarrow March was a response to extreme hardship brought on by the Great Depression. It invokes pain and suffering. In their note, reassuringly titled “Mayday! Mayday!” Credit Suisse’s Boussie et al. also note that they expect rising unemployment to trigger a slackening of the “robust” consumer sector, which in turn could cause even more serious problems for the economy. Well the retail sales data isn’t quite what they were hoping for when they sent out their Mayday alarms. And on August 17, 2016, the ONS also released the latest – Total Claimant count SA (UK) – thousands – which provides information about the number of people seeking unemployment benefits. 19 Ingelesez: “I was looking for a dramatic rise in claimants (unemployment). A rather large decline of 8,600 or 1.1 per cent (seasonally adjusted) in July 2016. Oops! Since January 2016, the claimant count has been rising each month. July marked a break in the trend even though the economists in the financial markets had reached a “consensus prediction” of a rise of 9.5 thousand. A little matter of a massive prediction error – nothing to worry about. No one will be punished for spreading spurious information designed to alarm the public. The other labour market data released on August 17, 2016 by the ONS covers the quarter to the end of June and while the unemployment rate was stable, it is not really reasonable to claim that as another piece of evidence that the vote didn’t matter much. I haven’t looked at the sharemarkets today but last time I looked the aggregate indexes were heading towards the stratosphere – like record high levels. And other financial market indicators appear to be unaffected – for example, the bid-to-cover for British government gilts is not plunging. The large pension funds are falling over each other to keep stocking up on government debt – yum, lovely public debt, more corporate welfare! Markit released the latest – Household Finance Index – for the UK on August 17, 2016. This provides a guide to the state of household expectations about their financial situation. 20 Ingelesez: “The Instituto Nacional de Estadística is the national statistical office for Spain and publish excellent data on Tourism into Spain. Guess what? The hotel short terms trends data released yesterday shows that British citizens are flooding to that sunny destination even though travel costs have risen due to the decline in the pound. Overnight stays rose strongly in July 2016. 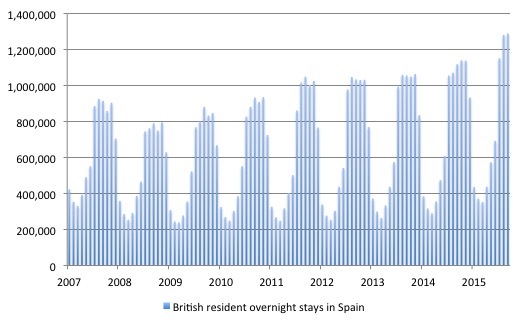 The following graph shows the data for overnight stays by British residents in Spain since November 2017. You can see the seasonality. But even with the pound at much lower levels than before the vote, those sun-loving Brits have not been discouraged from heading down to beautiful Espana for vacations. 21 Ingelesez: “And if that wasn’t enough, the Verband der Sshweizerischen Uhrenindustry aka the Federation of the Swiss Watch Industry, published data on August 20, 2016 that shows that Swiss watch exports to Britain rose to 110.2 million CHF in July 2016, up from 90.6 million CHF in June 2016. This 21.6 per cent increase was the fastest growth of all the Swiss manufacturers’ major export markets. What is going on there? Well Britain is now a tourist mecca itself courtesy of the lower pound since Brexit and within that shift the so-called “luxury goods market” is booming. Japan, Indonesia and the US were the nations that accounted for the biggest increase. Despite Japan’s own economic problems, spending by Japanese visitors was up 96% in the UK compared with July 2015, while travellers from Indonesia spent 88% more than last year on tax-free shopping.Chinese tourists’ spending was up just 6% for July, but the country still accounted for the largest portion of spending overall, with a 32% share. The CBI said that “export order books reached a two-year high, suggesting that the depreciation of sterling since the end of last year may be feeding through to stronger overseas demand … [and] … remained comfortably above the long–run average”.